Birding Is Fun! : Cub Scouts and Owls! Before I headed out to Fort Boise WMA Saturday morning, I first waited with my son Kyle for his Cub Scout Pack to stop by to pick him up on their way to Round Valley for the annual Klondike Derby. We decided to wait at the entrance of Avimor for their convenience. It was foggy and cold, so what did we do? We jumped out of the truck and spent some precious minutes together birding! A Black-capped Chickadee called from a nearby tree. A flash of red whizzed by as a Northern Flicker flew overhead. We heard the distant quacking of Mallards and within seconds they shot out of the fog in clear view. 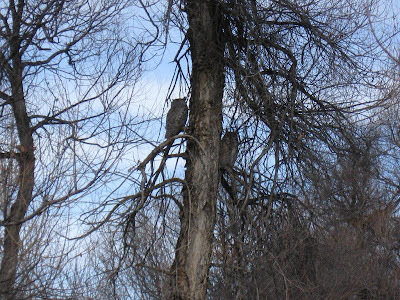 We were delighted to find Avimor's 1st Couple, the Great Horned Owls in the tree they seem to reside in most mornings. When the two car loads of Cub Scouts arrived I casually asked if they'd like to see some owls. Cub Scouts and leaders literally spilled out of the doors and lined up along the rail of the bridge overlooking the stream and trees where the owls tend to hang out. Lots of "ooo's" and "ahh's" from the boys, for most of whom this was the very first owl sighting in the wild! Ya just gotta love it! I located seven Great-horned owls in the last two days. I hope the odd one finds a mate. Just great Amivor. Who knows, you may have some future birders in that pack! Fantastic! I love seeing owls but rarely get the chance to. A great experience for kids.